We are not being given the truth about our health . . .
We're told to avoid saturated fats, we're marketed health food laden with sugar and we're encouraged to pound out miles at the gym. However, our chances of obesity are increasing - raising our risk of Type-2 diabetes, cancer, dementia and heart disease. Now cardiologist and world-leading obesity expert Dr Aseem Malhotra and acclaimed filmmaker Donal O'Neill combine the wisdom of this remarkably long-living population with decades of nutrition and medical research to cut through dietary myths and create this easy-to-follow lifestyle plan. This isn't a diet or lifestyle, which requires saying 'no' to the things you love, or exercising for hours upon end. 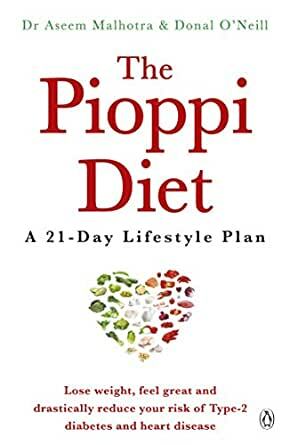 In just three weeks, The Pioppi Diet will help you make simple, achievable and long-lasting changes to how you eat, sleep and move - changes that all of us, no matter how busy we are, can make. As heard on . . .
and as seen in The Telegraph . . . Lose weight and live longer, happier and healthier whilst eating the food you love, with this revolutionary new Italian approach to diet and lifestyle. A real treat to read - holistic, practical, beautiful photos, and includes simple, quick exercises that can be done throughout the day (to help with blood flow and metabolizing foods). Pioppi Diet also includes clear, simple explanations of key biological processes involved in health and metabolism. The section on reducing stress is the best thing that I've read on that general topic. I'll be giving several copies as gifts, because it's an excellent resource. For those that have seen "The Big Fat Fix" movie, this book expands on it. It's not a "diet", it's a lifestyle that can help you live longer and healthier. Well written, easy to read, easy to implement. Not sure why it hasn't gotten a wider distribution in the U.S., I had to order my copy from the U.K. Great info for people interested in following a low carb or ketogenic Mediterranean diet and lifestyle. This is one of the best books I have ever read in the area of health promotion. I have been reviewing research on lifestyle strategies for promoting cardiovascular health for 20 years. The Lyon study, one of many referenced in this excellent book suggested that significant reductions in rates of heart disease and stroke might be possible through the right diet. In this "game changing" book, cardiologist, Dr. Aseem Malhotra, shares a wealth of cutting edge research on nutrition, and lifestyle strategies that can help all of us swiftly improve well-being, and our potential health outcomes. I have already put many of these strategies into practice. I highly recommend this book. 5.0 out of 5 starsA sensory read! I could almost picture what life would be like in Pioppi! I could smell and taste the food in the air that is how well it was described. I will be trying more to implement these guidlines in my life from now on. This illustrations were very handy for the the exercises, I like a book to have detailed pictures throughout. The recipes sound delicious and the food is everything I love but I have been too scared to eat more of. I appreciated the research studies shared in this book and what I have personally researched over the past 8 years in regards to disease progression. It's unfortunate that our food industry's products do not corroborate with the research findings and that our youth in America is expected to have a shortened life expectancy because of the increase of disease.